With the New York Fall/Winter 2013 collections drawing to a close, many of the big name models have yet to set foot on a runway. 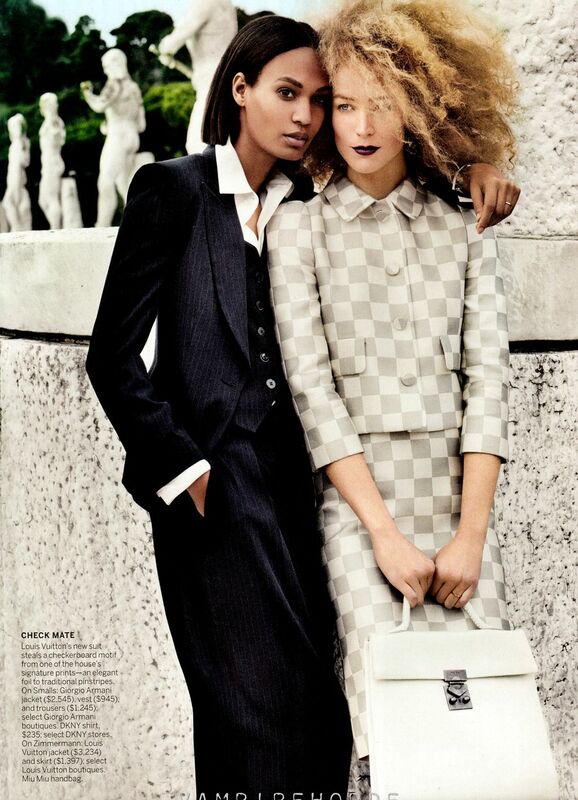 Supermodels Joan Smalls and Raquel Zimmerman both of whom have been conspicuous by their absence, surface in the March 2013 issue of American Vogue lensed by Mario Testino playing star-crossed lovers. 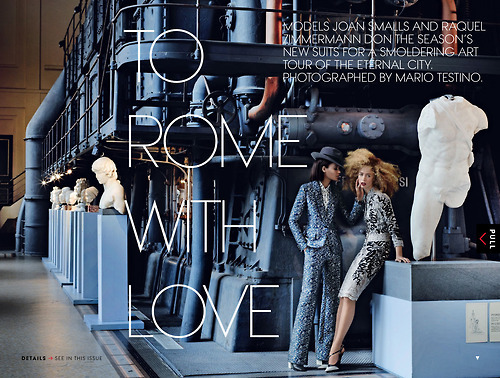 Testino captures Zimmerman and Smalls as they indulge in a little tete-a-tete whilst taking in the artistic sights of the eternal city Rome. The two models are perfectly cast with Zimmerman's unruly blonde tresses and pale alabaster skin contrasting beautifully with Smalls luxuriant caramel skin tone and nape grazing bob. Smalls takes on the role of the aggressor, pursuing Zimmerman whilst decked out the the Spring/Summer 2013 season's finely tailored jackets and pants. Zimmerman meanwhile is the object to Small's affection looking ever so demure in pencil skirts which caress the knee and matching jackets. Look out for more of Smalls and Zimmerman as they continue their Italian sojourn on the runways of Milan.